I’m pleased to show you a little side project that’s evolved out of #30x30DirectWatercolor2018! One of our 30×030 guest-artists, Maria Coryell-Martin is the designer behind Art-Toolkit.com, a project where she’s creating the ultimate compact watercolor palette. Her system is a unique product based on her experience as a travel sketcher in the most extreme locations around the globe. At the same time, it’s super-cute and fun for people who are just scooting around town making sketches in their daily lives. I’ve talked before about the kits Maria has sent me to play with. This year, in preparation for the 30×30 event we decided to go one further! The Direct Watercolor Palette is a 12 color selection, chosen by me to be my absolute minimum landscape and urban sketching palette. 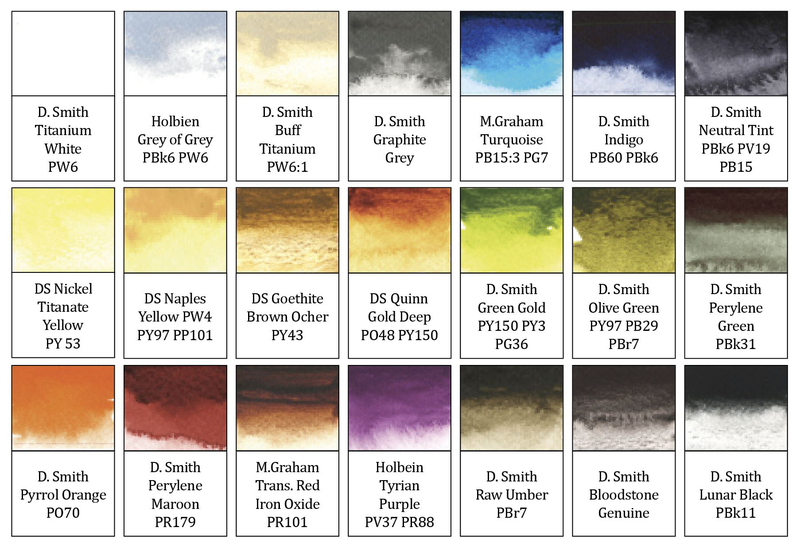 These colors are based on the larger 21 color palette I’ve fine-tuned while working on my book Direct Watercolor. These are my desert island choices. When I want the smallest possible portable kit, this is what I’d bring. Maria has created a special limited edition of her Art-Toolkit, set up in my ideal layout, with two big mixing areas, and 12 mini-pans pre-filled with Daniel Smith watercolors in my color choices. Supplies of this kit are limited! If you’re in the market for a compact kit – maybe to help you with your daily paintings in #30x30DirectWatercolor2018 – order your limited edition Direct Watercolor Palette today! BONUS TIP! Maria is also running a giveaway for the Direct Watercolor Palette on Instagram. Visit @ArtToolkit [www.instagram.com/arttoolkit/] to enter! Well, I can’t say if it will make it easier :) But these are the colors I’ve narrowed down to over time. I use the whites and greys in there more than I ever used to – for urban scenes and a slice of life things for sure. So, for *me* it makes things easier :) :) One thing this set CAN’T do is flowers for instance:) It’s a very neutral, well – urban – set. Not too many bright colors! I’d say these are Montreal colors! I received my palette today Marc…and right away was missing a cool red and a cool blue to make purple…and there is no magenta…I checked out your 21 colour palette…there is but an addition of Holbein Tyrian Purple…still no coll red/magentas….do you never paint something bright….with a pop of magenta or violet? pretty muted palette you set up….guess it is for pavements and buildings…definitely not fruit markets or botanical gardens in bloom with colourful flowers…Would you have any suggestions as to what colours to add to the palette I bought…that would help me achieve something a bit “livelier”? thanks in advance..Janis and thanks for doing this…great challenge a painting a day…what ever it may be…urban or not. fair enough…I wish you had added that in your description of your palette that you are selling that I bought….at least that it was unbalanced and totally leaning towards a neutral/dulled colour effect. Ah well, I did post the color chart showing what was in there. Sorry if you are unhappy with it – really the palette is still very useful even if you decide to replace the colors with your own ? I suppose we didn’t think you’d want “my colors” if you weren’t a fan of what I get out of them. I’m not in a business relationship with art-toolkit, so I don’t know how they handle returns. You could contact them and see if they’ll replace it, or perhaps give you a deal on replacement empty pans to re-set it up yourself? Again, I don’t know but it’s worth asking. Ridiculous. This is the seventh “post” you have sent out today. I should keep the account open to see how badly you can embarrass yourself. My God. You REALLY blew it because I was a vocal fan. Hey Lori, thanks for the feedback! You’re the second person who’s mentioned that was not to your liking. Thanks for letting me know – and I won’t do that again. I should have created a separate page for everyone’s bios. I wish I’d thought of that at the time. I apologize! Whoa, chill out, Lori! I found it really exciting to see all the posts at once because I knew this would be big! Am looking forward to seeing all the watercolors next month! Another great challenge/initiative, Marc! Thanks so much, Marc, for sending on other artists’ backgrounds, sample paintings, and responses to your great questions. Yes, already feel like I’m part of the group, and wonderful ideas and advice! I use a lot of bright colors and just bought this as a control to explore something new. I’ve never done a challenge before and am exited to try! Looking forward to participating Marc. My name is Steve Mitchell and I run a YouTube channel called The Mind of Watercolor. I found out about the challenge through Anne-Laure’s YT channel. I very much want to have some daily loosening up practice. I have and enjoy your Direct Watercolor Book and have only just discovered your excellent blog. If you don’t mind I would like to give this challenge a plug in my next video. This is going to be fun!